Two Outdoor Adventures Set for February! Join Us. The winter weather this put a few kinks in this winter seasons hikes. But we know the weather is looking pretty good from here on out. So, mark your calendars for TWO hikes in February. Next Adventure: February 15th, 9:30am. Get ready to hike the most northern section of the Sylamore trail. We have not hiked this section of the trail yet, so get ready for some new adventures! Join US, as we will leave the Indian Hills Country club parking lot at 9:30AM and stop at Cody’s restaurant in the big town of Fifty Six north of Mountain View for brunch. Following the hike we will return to Fairfield Bay for a bon fire and chili feed at Tom Sherry Welch’s home at 233 Maddox Drive. Come get to know this lively group and enjoy a beautiful hike together. 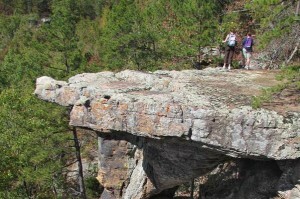 Save the Date: On Feb. 22, 2014, we will Hike the Pedestal Rock Trail again for those of us who could not hike this VERY scenic trail in November. The drive to from the trail head is also a very scenic drive offering miles of panoramic views The Pedestal rock trail head is near the City of Ben Hur about an hour west of Clinton on highway 16. There is an optional second hike to a water fall at this trail head. Again the group will meet at the IH Country Cub parking lot at 9:30 a.m. and stop for Brunch at the Leslie Café (The “Hippie Café). Save the Date: The last hike of the season will be held on March 8, 2014. There are tentative plans for a bike ride around the Mountain Ranch Development in early April. We will also return to the upper Buffalo River for our annual white water canoe trip in late April. The annual leisurely Buffalo River float will be scheduled in mid May. For More information about the Outdoor Adventure Group, please contact Tom Welch at [email protected] if you’re interested in participating in this hike or any other activities.